As the temperature rises in the Antarctic Spring, the Weddell Seals chew holes through the sea ice to sun themselves and their pups. 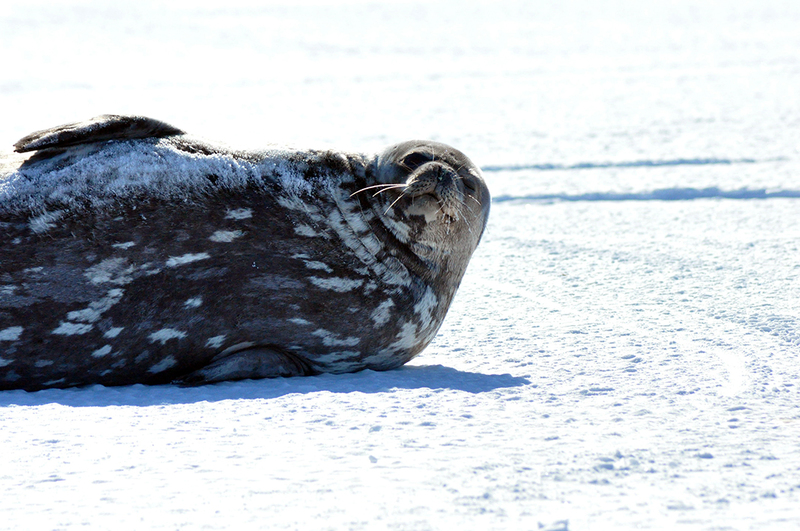 On a clear day like today, their tear drop-shaped bodies standout like giant slugs lying on miles and miles of sea ice. They like to recline on their backs, baring their bellies to the gradually increasing heat from the unending Spring sun. The 700-800 lb. adults are not at all intimidated by humans, especially a composer. As aliens, our clumsy attempts at navigating this environment must be glaringly obvious to the locals. The seals responded to us by lazily turning their heads before summarily ignoring us. The bright rays of the sun on this icy beach were much more interesting than us. 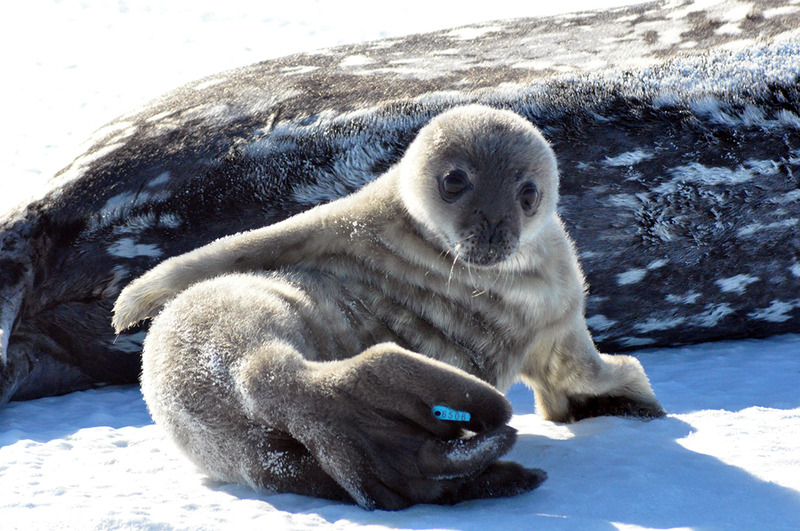 We came close enough to notice that a couple of seals were wearing their research tags, flaunting their credentials as bonafide members of the McMurdo scientific community. 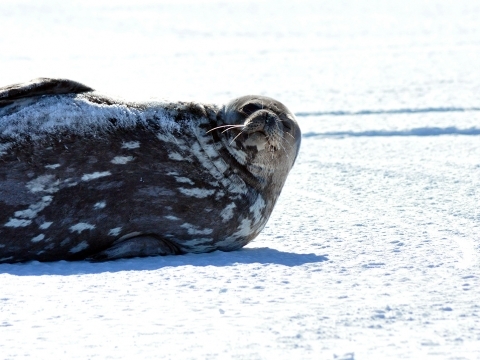 In another month or two, the sea ice will be gone and the sunbathing seal families will be joined by orcas and other seasonal visitors to McMurdo Bay. Last night was open mike night. The Coffeehouse is an old quonset hut that served as the officers’ club back in the 1950s when the US Navy built the station. It looks like it was plucked off the set of the Korean War TV series M.A.S.H. The barreled ceiling wraps around a dense herde of comfy couches, diagonally facing a humble stage. The microphones and speakers are framed by a 6-foot tall penguin playing a bass. I always wanted a penguin behind me playing bass. I grabbed a guitar from the Gear Shop. There were a couple of well-worn guitars to choose from on the shelves between the cross country skis and the mountain climbing ropes. The gathering of performers, like so many other parts of McMurdo life, crossed boundaries. There were country songs, jazz standards, original songs and much more. An NSF research diver on jazz guitar and a singer from the equipment distribution center played a gentle arrangement of “Autumn Leaves.” The couches were packed and the back door was bursting with others trying to get a glimpse of their colleagues making music. The guitar I borrowed stayed reasonably well in tune for a couple of songs. It felt good to sing. The cold was forgotten for a couple hours as our coworkers sang about laughter, sadness, hope, love, loneliness and all the other things that make us fully human. It doesn’t take long for news to travel through a small outpost like McMurdo. Secretary of State John Kerry will be visiting us next week as part of series of appearances around the globe highlighting climate change issues. 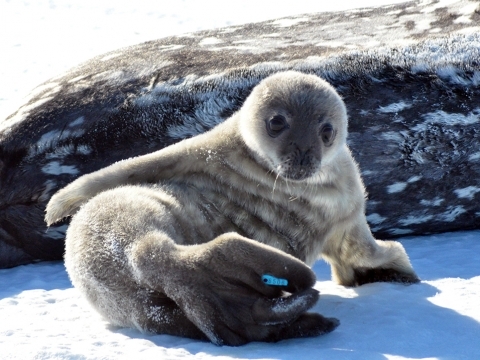 His visit follows last week’s signing of a new treaty that protects the Ross Sea Marine region. He will visit both McMurdo and South Pole stations. With all the security and logistics infrastructure that comes with his VIP status, Secretary Kerry’s schedule will be dictated by the same forces that govern the rest of our lives here at McMurdo. Like the seals on the ice shelf, Antarctica lazily turns its attention to newcomers, then summarily ignores the trappings of human rank and privilege. Antarctica returns to soaking up the Spring sunlight.